When I first had this cabbage salad in Saipan, I thought it was an island favorite and I asked around for the recipe. Imagine my surprise when I came back to the U.S. years later and learned that the ramen noodle salad was almost ubiquitous. It’s still a favorite around our house, and it makes a great salad for summer cookouts since there is no dairy in the dressing. I originally made this with seasoned rice vinegar, but I think it also tastes great with apple cider vinegar. Adapted from my friend Jan Springer in Saipan, CNMI. Put chopped cabbage and green onions together in a large bowl. Refrigerate for at least one hour. Combine all the vinaigrette ingredients in a jar or cruet and shake well. Just before serving, pour all of the vinaigrette over the cabbage and onions and toss well. 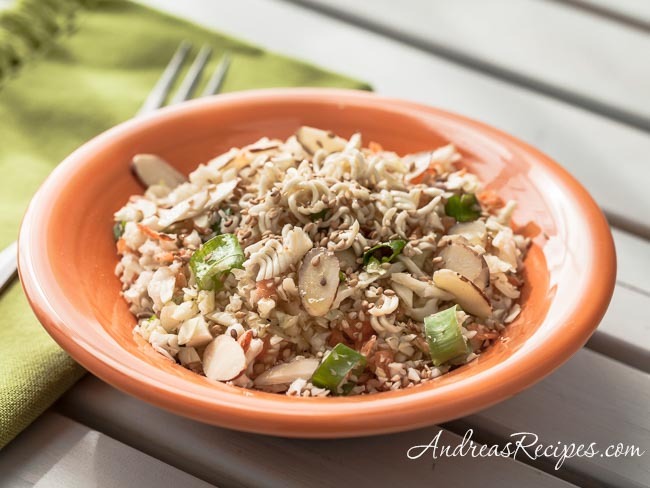 Toss in the sesame seeds and almonds, and sprinkle the crumbled Ramen noodles on top. You can prepare everything a day ahead and keep in the refrigerator, then stir in the vinaigrette, sesame seeds, and almonds just before serving. Everyone makes this type of salad in Utah, sometimes with chicken added. I’m trying to think of what you could use for the ramen noodles that would be made with whole grains, because I don’t think I could pass off ramen noodles as being South Beach Diet friendly no matter how hard I tried! This salad was a family favorite growing up! We would add just a touch of the ramen noodle seasoning to give it a kick – and we called it Chinese Cole Slaw. Now I am craving it! We make this too at my house…we simply call it like it sounds…CRUNCHY SALAD! We use the Ramen spice packet too, but I’ve been anxious to try another seasoning combination that doesn’t have as much sodium. I have a similar recipe from a German friend, and she guaranteed to me it was German, funny, how the recipes go round. I tried it once though when I wrote it down a couple of years ago. This is like a nice reminder to look up my old recipes. How funny! I never cease to be amazed at how recipes spread, yet mutate and and get different names in different regions, especially in the days before mass communication. Thanks for sharing your names for this salad! Wow, I like your blog. I didn’t know where Sapian was and have just checked out the link ! gonna try and make the salad it looks different! I am new to blogging, I have just started my food blog, pennypincherspantry in the uk, so I am just looking round the blogs and there are some amazing ones, like yours. Wow!!! I have added you to my blogroll!